Alloc, the world leader in laminate flooring with patented mechanical locking system, is a member of the Beaulieu International Group. The Beaulieau International Group is a world leader in the manufacturing and marketing of floor covering. We are focused, innovative and dedicated to mechanical locking systems. We implement total quality management in purchasing, manufacturing, distribution and customer service. 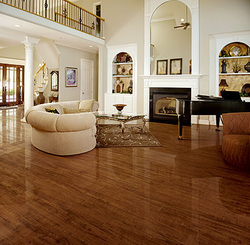 Alloc Original laminate flooring offers the most advanced style and strength in laminate flooring. We call it ‘Original’ because that’s what it is—the original line of laminate flooring that started the category over a decade ago. With this history of flooring success, today’s Alloc Original has an array of authentic wood finishes and engineered durability. Alloc Original is the right flooring choice for anyone seeking superior beauty and durability in a laminate floor.